I am excited to be participating in the Witches & Witchcraft Reading Challenge (my first ever reading challenge as a blogger! ), hosted by Melissa's Eclectic Bookshelf. Any full-length book with a witch as a main character, or books with witchcraft themes count toward this challenge. Each month, there will be a post on Melissa's blog to link up reviews. This is my official challenge post to track my progress. I'm aiming for the Maiden level of 6-10 books. I am so glad that you are joining Melissa!! 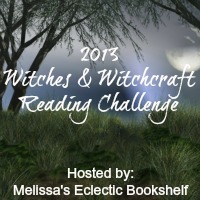 Welcome to the 2013 Witches & Witchcraft Reading Challenge!